Zoot around on a little scooter and look really cool. These fun little scooters are trendy and vibey. They offer an ideal opportunity for any business in the scooter related industry to create a fabulous advertising campaign that will delight your clients. Brand them with your personalised company logo and graphics and hand them out to clients at trade shows, expos, outdoor events and product launches. You are sure to put a smile on their faces. The scooter is part of our fabulous range of stress toys that are manufactured from high-quality material that is pliable and strong and returns to its original shape no matter how much it is squeezed or squashed. Stress toys are perfect for all ages and all types of people. Use them to get rid of all your frustrations. Keep one on your office desk, your home desk, your school desk and in your car.They are great for your health and your body and mind. Our fun little scooter offers a trendy design in three-dimensions. Our artists have paid great attention to detail creating a true replica of the real vehicle. Little handle bars adorn the front, a padded seat looks totally comfortable and two little wheels finish off the look. 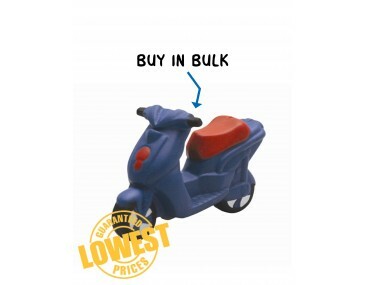 The scooter comes in a sophisticated corporate colour, ideal for any discerning client. Allow us to help you with branding ideas. Our listed price includes branding of your logo or graphic in a single colour print. Please note that our prices exclude GST and a print set up of $75 applies. This product is supplied in bulk quantities.